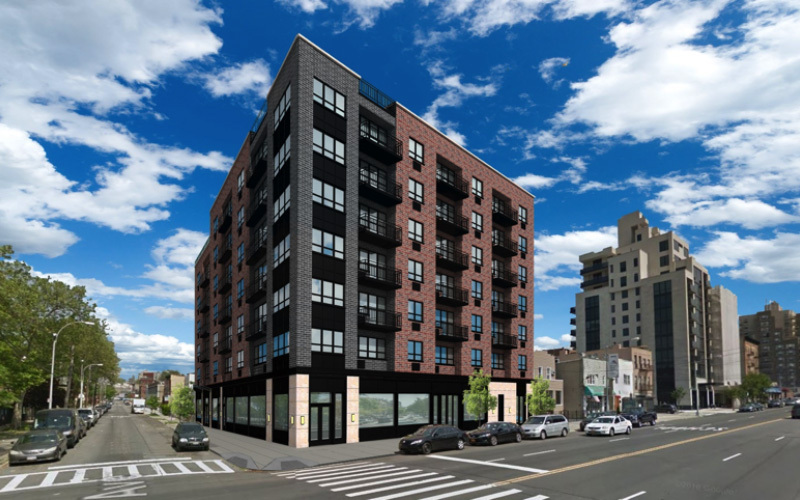 Queens, NY According to Carl Schwartz, CEO of Falcon Pacific Builders, LLC, the company has topped out the construction of a 50-unit rental and retail building located at 28-16 21st St. in the Astoria neighborhood. The new seven-story building will be comprised of 58,000 s/f and consist of 50 apartments and 11,000 s/f of retail space. This new development will provide a mix of affordable and market rate rental housing. Twenty percent of the units will be allocated for affordable housing under New York City HPD guidelines. The architect for the development is Matt Markowitz, AIA, and the building is designed with recreational space amenities, common spaces in the basement and a rear tenant courtyard. “We are very pleased to have been selected for this new Astoria construction project and are thrilled to be nearing completion,” said Kent Swig, president of Falcon Pacific Builders. Falcon Pacific Construction and Falcon Pacific Builders are a New York City based construction company, infused with an ownership understanding and approach to its projects. The two divisions are focused on ground up construction and building wide and interior renovations throughout the Tri State area surrounding New York City. The company’s successful track record is built on its ability to build positive working relationships with architects, engineers, local officials and vendors to achieve client goals. Falcon Pacific is owned and operated by Kent Swig, Carl Schwartz, and Joe Caraciolo.